Spring. The city awakens from its gloomy winter sleep to meet the beautiful sun rays. Days become longer, flowers bloom and we are ready for new experiences! I really love spring and the endless colorful pallette the nature provides! Our black wardrobe is replaced by an explosion of bright colours – typical for this season! Altough green is being “modern” this year, my all time favourite is RED. I love it from the bottom of my heart for every clothing, accessories, shoes – it really gives them more life than ever! Even the most boring black & white outfit can be renewed by the presence of a red accessory. A coat in saturated color other than beige, black and white – is definitely a must this spring! I’m a big fan of the cute pink coats, but I never found one to grab my attention. And until I find the “perfect” one, here is a great idea for an urban outfit – fresh, springish and with one of the most popular trends – embroidery on denim! Enjoy! Пролет. Градът се пробужда от зимния мрачен сън, за да посрещне прекрасните слънчеви лъчи. Дърветата се разлистват, денят става по-дълъг, а настроението ни – вече е приповдигнато и готово за нови изживявания! Обичам пролетта и всички безкрайни цветове, които природата ни предоставя! Черно-сивият гардероб се заменя с експлозия от ярки и наситени дрехи, присъщи за този сезон! Въпреки модерния зелен цвят тази година, моят “all time” любимец е червеното. Обичам го във вид на дрехи, аксесоари, обувки – разчупва визията и й придава живот! Дори най-скучният черно-бял аутфит може да бъде забелязан при наличието на червен аксесоар. А палто в наситен цвят, различен от бежов, черен и бял – определено е задължително тази пролет! Голям фен съм и на розовите палта, но така и не намерих подходящо, което да ме грабне. А докато намеря “идеалното”, ето една страхотна идея за градска визия – свежа, пролетна и с един от най-харесваните трендове – бродериите върху деним! Enjoy! I love spring. It’s the best season. The whole nature wakes up to a new life. The birds sing a happy song and the sun shines all day long. What is there not to love? Your urban outfit is perfection. 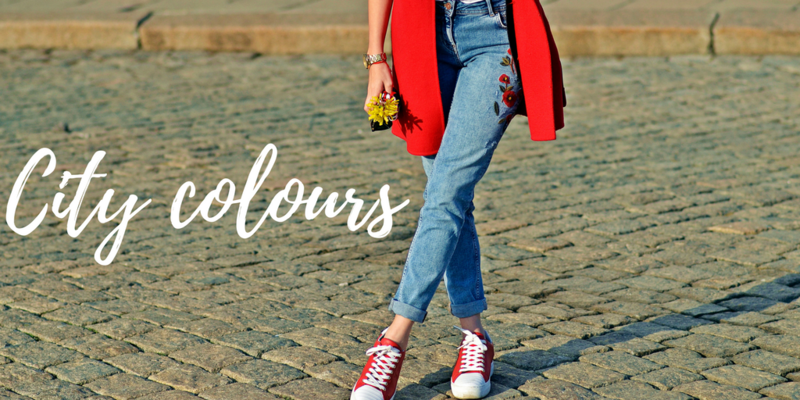 The red coat, the embroidered jeans and red sneakers – I want them all, and I want them now. The funny thing is I used to hate red colour for many years but now I am crazy about it. 😉 Great photos, by the way. This is the nicest comment I have read regarding my style! Thank you so much <3 I used to hate it also, but I couldn't stop myself buying the whole outfit! Thank you so much for your effort to write all this! Your tip is very helpful and I will try to remove the problem as soon as possible 🙂 Thank you also for reading my blog – it means a lot to me! Thank you! You can find them in ZARA. They are from the new SS17 collection and are cheap for this gorgeous embroidery! Black, white & red is the ultimate colour combo, no-one will ever tell me otherwise! You styled this really well too! I love how you styled this with all the red accents! It’s super pretty and I especially love the embroidery on he jeans. Got me so inspired for Spring now! Such a great spring outfit! I love that red popping color!